After 400 years of Portuguese rule, Macau was returned to China as a Special Administrative Region of China on December 20th, 1999. For the next 50 years, Macau, like Hong Kong, will be allowed to have its own economic system and government. Despite belonging to mainland China, visitors traveling between any of the 3 regions are still required to show their passports upon entry. buildings and added several new attractions. Macau provides an ideal escape from the busy streets of Hong Kong, while still providing 4-star hotels and fabulous restaurants, most of which are much cheaper than those offered by their Hong Kong counterparts. Though Hong Kong is now a thriving port city, Macau was a leading trading harbor in the early 1600’s. At that time, the Portuguese held trading posts in Goa, Malacca and the Moluccas, which allowed them to control trade between Europe and Asia. Even with these outposts, attacks by Japanese pirates continued until the Portuguese forcefully cleared the waters in the region. China formally thanked Portugal for stabilizing the region and developing trade routes by giving them Macau in 1557. The Portuguese became the middlemen by sailing shipments of Indian goods, European crystals and wines out of Goa and trading Chinese silk for silver, swords, and lacquerware in Nagasaki. The ships would then return to Macau and trade the silver for silk and porcelain. The ships would then return to Goa where the Asian goods were sold to European customers. As the region prospered, the Dutch unsuccessfully attempted to take over Macau from the Portuguese. However, the Dutch dealt a crippling blow to the Portuguese trade routes when they negotiated for exclusive trading rights with Japan. Macau was hurt tremendously by the exclusive relationship between the Dutch and Japanese in the 1630’s. And with the development of Hong Kong in the 1800’s, Macau never quite returned to prominence in the area. But in the 1970’s the Hong Kong people and tourists began to visit Macau for its Mediterranean feel and casinos. Now, Macau’s biggest industry is gambling, with over 4 million Hong Kong Chinese going to the casinos each year. One of the most famous tourist attractions is the ruin of St. Paul’s Church, which was built in the 1600’s, located in the center of the city. Unfortunately, because of a fire during a typhoon in 1835, the church burned to the ground and only the façade of the church remains. Also, in the same area, is the Museum of Macau which gives an excellent depiction of life in the 1600’s and the comparison of the European and Chinese traditions, ideologies, and ways of life. A solid history of the development of Macau is provided within the walls of the Maritime Museum, located in front of the Inner Harbor. They offer a 30-minute ride aboard a restored fishing junk in next to the museum. It is the oldest museum in Macau and accurately portrays the influence the sea has had on the island and its people. In addition to a commanding view of the harbor, the museum also offers a 30-minute ride through the harbor aboard a restored fishing junk. Another key attraction is the large section of the museum devoted to the legend of A-Ma, the Chinese goddess of seafarers. For the protection and comfort she provided on long journeys, the early sailors built the A-Ma Temple, which is situated on a scenic overlook which, before land reclamation, dropped dramatically into the sea. The 600-year old temple is beautiful to behold and provides a tranquil setting to enjoy sunsets over the harbor. Macau is also well known for its delectable Portuguese restaurants. A perfect way to finish one’s trip with fond memories would be to dine at A Lorcha Restaurant, just down the road from A-Ma Temple. How to get there: Macau is only 40 miles west of Hong Kong Island, across the Pearl River Estuary, and can be reached by jetfoils, helicopters or planes. The jetfoil rides takes only 45 minutes and costs about $20 U.S. (one-way). The currency of Macau is the Pataca, but Hong Kong currency is also accepted. 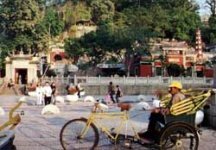 For more information about Macau, check out the website: http://www.macau.tourism.gov.mo.